I'm so thrilled with the relationship developing between my boys. Buddy loves Teddy Bear and the feeling is mutual. 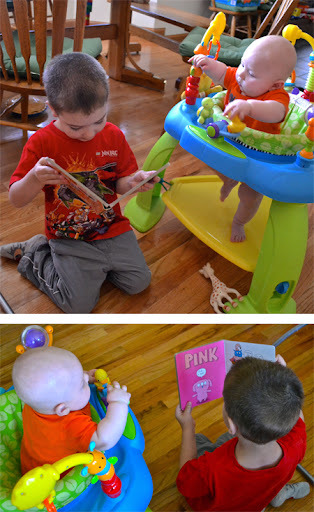 Buddy enjoys reading to his baby brother. He also enjoys hugging and kissing "Little Chubbers." No one can resist Teddy Bear's sweet, kissable cheeks. Buddy is especially talented at keeping his brother happy. That is a skill I'm am more and more grateful for these days. Teddy Bear is awfully lucky to have such a great big brother. I wonder if their loving relationship will outlast a mobile baby who can steal toys. Another few months and we shall see.